Add a new brand of seltzer to your holiday spritzer with Waterloo Sparking Water. Waterloo is available in 8 mouthwatering flavors including NEW Mango, Original, Black Cherry, Watermelon, Coconut, Lemon, Lime & Grapefruit. Waterloo has zero calories, sugar or sodium. Waterloo Sparkling Water offers Non-GMO Project Verified natural flavors in BPA-Free cans, made with Vapor-Distilled Water (Reverse Osmosis). Waterloo is certified gluten-free and vegan, as well as kosher. Plus, it does not contain citric acid or fluoride. 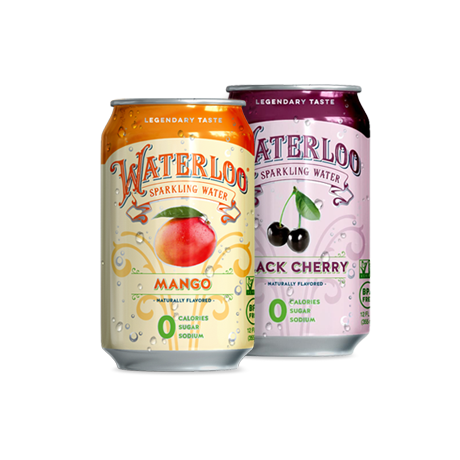 With the summer sensation of alcoholic seltzers, Waterloo Sparkling Water is another great option for drinkers and non-drinkers alike. Whereas brands like the original Spiked Seltzer® is about 140 calories, grab a Waterloo and mix with your favorite gin (mine is Philadelphia’s own Bluecoat) or Blackbox Vodka and you are at a robust ZERO calories! Having the Holidays and New Year’s right around the corner, you can create your own sparkling bevy. Throw a little cranberry in with lime flavored Waterloo and voila! Every flavor tastes just like the fruit described without any aspartame or sugar sub taste. Just crisp and freshly tasting fruit that is equally refreshing. Although not intended to drink as such, it also tastes great flat! Waterloo Sparkling Water can be found at your local Whole Food Market at roughly $5.99 for a 12 pack. A little pricier that Coke’s Bubbly brand, but you can tell the difference in taste and quality.